Love diamonds but are looking for a change of color? If you are, then choose these ½ Carat Blue Diamond Stud Earrings by VIR JEWELS. Break free from traditional black and white diamonds and experience the beauty and glamour of colored diamonds. 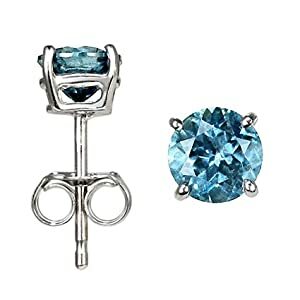 These earrings are crafted in solid 14-carat white gold and feature square shape gorgeous natural blue diamonds. Add color to your life and spice up your favorite outfits with this dazzling ½ carat blue diamond stud earrings. See more great options for superb 1/2 Carat Princess Cut Diamond Earrings.